Bees. The problem with bees is that they have no respect for the sanctity of human life, as if they were just a common ant. It's hard to understand quite why the ant has never made the transition to the silver screen, really: like bees they are an organised, social creature who will defend themselves to the death. Like bees they are capable of stinging you. And like bees they have mastered flight, albeit for only one day a year. The only difference is that ants do not have an Africanised killer variant and that bees do. The population of Texas in The Swarm are very aware of this, as a vast cloud of fuzzy black and yellow vengeance descend on the southern United States. First they take out a military base, then they completely shag a family picnic. Before long they are beginning to threaten larger population centres, leaving nothing but a trail of corpses and traumatised, pustule-strewn, lumpy survivors hallucinating giant bees. The only response the human race seems able to muster: Michael Caine shouting at everyone and half a town's male occupants trying to pork schoolmistress Olivia De Havilland. The Swarm is widely regarded as one of the worst films ever made. It isn't, of course, but its reputation was earned by the gulf between its budget and its fairing at the box office. None of these things have any real bearing on the quality of a film. There's also no reason that a film with an all-star cast like The Swarm shouldn't ultimately produce a wretched film, as there are so many other variables at play. Where they don't have too much of an excuse, however, is for wretched acting. Michael Caine, Richard Widmark, Henry Fonda, Olivia De Havilland, Slim Pickens and Fred MacMurray are all on display and yet the most believable performers are the bees. 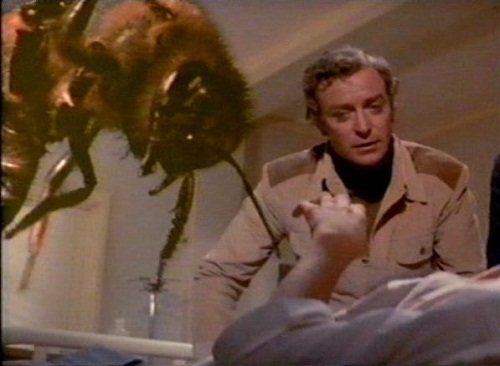 The bees are the only star turn that matter in The Swarm, although Michael Caine's hysterical turn as an entomologist wins me over every time. The sheer tenacity and resilience of the African killer bee is something to behold. If The Swarm is an accurate depiction of their lust for life then everyone in the world should be grinding their teeth with panic. As well as a spectacular series of attacks which cripples an underground military base, makes an orphan of a spotty teen and seriously disrupts a nascent love triangle of people old enough to do better, the bees also survive being driven into Houston and bombed by the National Guard. It's only when the bees are lured into the sea and set on fire - either of which is usually sufficient to kill a regular, ready salted, bee - that the threat is finally neutralised. The Swarm is one of the most preposterous, shrill, manic and bewildering films of all time. Everybody should see it. I give it FIVE out of ten disaster points. Because although it is brilliant, it is also shite - a winning combination. what do you mean no ants?